So it is GSoC time and I came across an interesting project which deals with linked data. In order to apply for it, I had to get Jena, a Java library for handling RDF graphs. The documentation provides info on how to configure Eclipse to use it. But Eclipse is not really my choice for an IDE. I prefer Netbeans. So I wanted to configure Jena to be used in Netbeans. Most of the resources I looked up suggested using Maven. But I wasn’t interested in that. After a bit of tinkering around, I managed to get it configured as a library in Netbeans. It is quite easy actually. Go to Tools -> Libraries and create a new library called Jena. 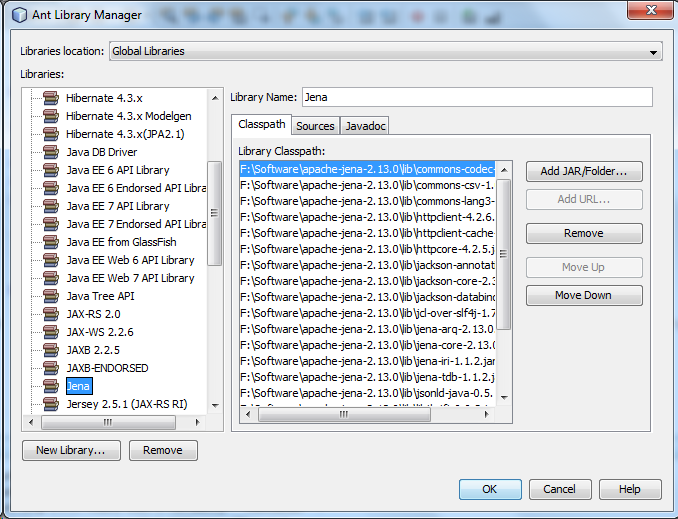 In the classpath tab, go to ‘Add Jar/Folder’ and navigate to the path where you extracted Jena and go to the ‘lib’ folder. Select all the jar files in the ‘lib’ folder and add them. Then, optionally, you can add the Jena source files and Java docs as well. And that is it. To use Jena in a new project, right click the libraries directory in the created project on the ‘Projects’ tab and select ‘Add Library’ and select Jena.